Make a quilt from the neckties of a family member or friend that has passed away to memorialize that person in a special way. Sometimes the act of making the quilt has a healing effect as each tie holds a special memory of the beloved person. Presenting the quilt as gift to a spouse, child, or grandchild is a beautiful way of giving them a special connection to the loved one that is no longer physically with them. A beginner to quilting can stitch this necktie 4-patch and star wall quilt, which is done in a checkerboard design. Download and print the Adobe printable templates on card stock. Trace an 8 1/2" square on another sheet of card stock. Cut out all the printed and traced template pieces. The finished quilt will be 32 inches by 32 inches. 1 1/2 yds cotton broadcloth (backing and 8 1/2" squares)-choose a color that coordinates with your tie colors. Embroidery floss-choose a color that coordinates with your fabric and tie colors. Necktie fabric preparation and quilt front piecing and assembly are all done with right sides facing and 1/4" seams. Stitching "in the ditch" is a quilting term that means to machine stitch between two stitched pieces on the seam line. This quilt uses a cheat for the binding. The backing is folded to the front in one piece. Pretty Prudent has an excellent photo tutorial for this technique. Wash and dry your collection of ties. They may come out of the machine a bit twisted and puffy, but don't panic. The weird shape is from the thick interfacing inside the tie, and you will be removing it. Open the seam that runs up the back of each tie using a seam ripper. Discard the interfacing. Cut away the lining on each point or use your seam ripper to remove. Open the ties and press flat. Each tie yields a lot more fabric than it looks like at first glance but even after preparing the ties, the long, thin, tapered length can be intimidating. Depending on the number of ties available for your quilt, cutting and piecing the ties to create a wider fabric will most likely be required. Lay the lightweight fusible interfacing on your ironing surface with the glue side (rough and shiny) facing up. Place one prepared tie on the interfacing with the right side facing up. Trace along the edges of the tie. Cut out the shape. With the interfacing and the tie together in the same way as when traced, iron the tie to fuse the interfacing to the back. This is a step you do not want to skip. Ties are cut and sewn on the bias. Interfacing stabilizes the tie fabric so you can sew nice, straight seams without distortion. Cut the tie into two to four equal strip lengths. Each strip will have a tapered end, each a bit smaller than the previous one. Place the strips together, alternating the big and little ends. Sew the strips together. Open the seams and press flat. Trace the 4-1/2" square patch pieces on the interfacing sides of the tie fabric. Note: You will need 16 pairs of 4-patch pieces for the wall quilt. Cut out the patches. Trace and cut eight 1/2" squares from the cotton broadcloth. Trace eight star shapes on the paper side of lightweight fusible web. Rough cut around each star. 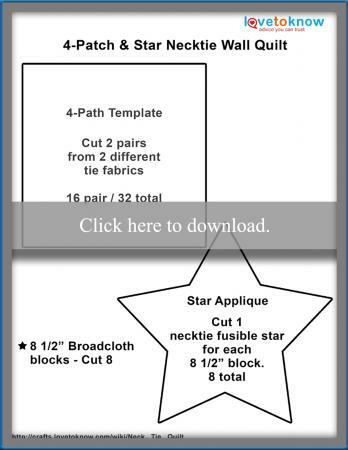 Place the traced stars on the interfacing sides of the tie fabric. Note: The glue side of the fusible web should be facing down. Iron the fusible web to the back of the tie fabric. Cut out each star shape along the traced lines. Choose two 4-1/2" pairs to make a 4-patch block. Place one of each pair together with the right sides facing and the edges matching. Sew along one edge to connect. Repeat with the remaining two squares. Place the new pairs together with the right sides facing, and the squares alternating in a checkerboard pattern. Match the center seam and pin one long edge. Sew the pinned edge. Open the 4-patch block. Open the seam and press flat. Repeat with the remaining 4-1/2" pairs to complete eight 4-patch blocks. Peel the paper backing from each of the fused stars. Center the one star on each 8-1/2" broadcloth square. Iron to fuse the star to the square. Using three strands of embroidery floss, blanket stitch around each star to applique. Lay the quilt blocks into four rows of four blocks each. Start with a star block in the top right hand corner and alternate the remaining star blocks and 4-patch blocks throughout. Sew the blocks together to form rows. Open the seams and press them flat. Sew the rows together to complete the top. Open the seams and press them flat. Cut a piece of batting and the backing fabric approximately two inches larger than your quilt front. Lightly spray one side of the batting with quilter's basting spray. Center the quilt front on the batting with the right side facing up. Using your hands, smooth and press to adhere the layers together. Turn the quilt over with the batting facing up. Lightly spray the batting with quilter's basting spray. Center the backing fabric over the batting. If there is a wrong side to your fabric, the wrong side should be facing down. Turn the quilt over with the front side facing up. To quilt the layers together, stitch in the ditch across the quilt and down the quilt between each star block and 4-patch block row. Trim the backing fabric one inch out from the quilt edge. Fold the backing 1/2" toward the front and press. Fold another 1/2" over the front of the quilt and pin. Miter-fold each corner and pin. Top stitch along the pinned fold to complete this easy cheater binding method. Hand-stitch a quilt sleeve or hanging rings to the back of your quilt for hanging. The number of necktie blocks can easily be multiplied or reduced to create bed quilts, table mats, and pillows. The following are adaptions and tips to help you with your chosen project. Note: These variations reflect a layout design in a checkerboard pattern. For a pillow-16" square, it is made up of two rows of two blocks each. You will need two blocks each of the star block and 4-patch block. For a pillow, the backing will be the same size as the batting, and both will be trimmed even with the front after quilting. Another backing of the same size will be required for the back of the pillow. For a twin quilt that is 64" x 88", arrange your blocks in 11 rows of eight blocks each. You will need 44 blocks each of the star block and 4-patch block. For a queen or double quilt that is 80" x 88", the grid on this quilt is 11 rows of 10 blocks each. You will need 55 of both blocks for a total of 110 blocks. Figure your batting and backing requirements in the same way as the necktie wall quilt. Flat sheets work well for backings on quilts as they come in a large variety of colors and designs. They are also much less expensive than wide quilt fabric. To add more memories to your quilts, consider embellishing with buttons from old dress shirts and suits. Quilts from ties can be made using any quilt pattern, and there are a variety of opinions and techniques for preparing and sewing tie quilts. Check out these inspiring links for more tutorials and choose the technique that works best for you. Anita at Yes I Quilt shares a wonderful tutorial for making a Dresden plate applique using ties. After assembling, you simply applique it to a background fabric. Enjoy the making of a quilt top with the video from stitchwoman1. The conversational video these two ladies bring you gives lots of tips and pointers for assembling a quilt top with sashing. Fons and Porter share a stringblock video tutorial with ties. This technique is similar to paper piecing and is perfect for a beginner quilter. This quilt from Deb Rowden's Thrift Shop Quilts would be a wonderful wall or lap quilt. No need to take the ties apart for this one. Simply weave ties together and stitch to secure. This is a very inspirational post with minimal instruction. Don't let that dissuade you. It's pretty self-explanatory and would be a great first project for a child. If you only have a few special ties, Carol Sews offers a tutorial for a lovely crazy quilt pillow using the flip and sew method. She even utilized the tips of neckties to edge the pillow. Don't let the lack of neckties in your closet stop you from creating a memory quilt you and your family can cherish for years. Head to your local thrift store to amass a collection that will provide the perfect background for your masterpiece or ask friends for their castoffs and add their stories to your quilt.